This award will be achieved by making a contact at least 50 km in distance between two stations, at least one of which must be activating a qualified SOTA summit. The elevation of the summit(s) is not relevant, unlike most awards in the SOTA program. Instead, increasing distances beyond 50 km between the two stations leads to higher level awards within each of these UHF bands: 1.2, 2.3, 3.4, 5.6, 10, 24, 47, 76, 123, 136, & 248 GHz. The distance involved in each single contact is analyzed for potential qualification for higher awards, and distances in two or more contacts cannot be combined to qualify for an award. As indicated in the microwave certificate illustrated in the SOTA shop, higher award intervals are all 50 km (up to 1,000 km). It is not necessary to earn microwave awards in sequence from low to high distances; one may jump to any distance, even working from high to low if desired. Award colors are similar to those used in the Summit to Summit Award, with distances broken-down within each color: red for distances of 50, 100, 150 and 200 km; bronze for 250, 300, 350, 400 & 450 km; silver for 500, 550, 600, 650 & 700 km; gold for 750, 800, 850, 900 & 950 km; platinum for 1,000 km and above. The provisions in the General Rules apply, with a few more exceptions. There is no seasonal bonus period. There is no SWL microwave award. There are no yearly limits on how often activators and chasers can score, but only one award claim may be made per summit per activating day due to the extensive distance-checking process at the award department. There is no scoring incentive for using more difficult modes. 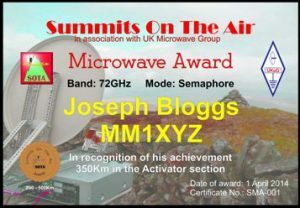 Microwave contacts can be used to support other SOTA awards, including summit to summit (which will be annotated on microwave certificates). For summit to summit microwave contacts, the database calculates the distance. For single activator contacts, one must enter the decimal latitude-longitude coordinates of the chaser in the notes section of the log in this manner: %QTH%37.3765,-121.8012% (leave no spaces). The award manager then calculates the distance manually. UHF signals can be a bio-hazard, and the operator bears all responsibility for resulting injury. The sponsors of the award, UK Microwave Group & SOTA, bear no responsibility for such injuries. K6EL on W6/NC-423 completes contacts on the same day with a chaser 107 km away on both 1.2 GHz & 10 GHz, qualifying for a red-50 and a red-100 on each band. By rule, he can apply for a single microwave award of his choice among the four possibilities, although he can re-climb that hill any other day and make another award claim. The mode is shown on the certificate. The chaser is also limited to a single microwave award for that summit on that day, even if he or she contacts a second activator there. K6EL on that summit can contact three more chasers on any HF, VHF or UHF frequencies that day, from any distance, to qualify for elevation-dependent activator awards along with his microwave claim. He can also move to additional summits that same day and attempt to qualify for an additional microwave award for each of those summits. G6WRW on Shining Tor contacts G0LGS on another SOTA summit 269 km away on 10 GHz and qualifies for a bronze-250 on that band in addition to all four of the Red distances. She claims the longer distance, as does G0LGS, and the award certificates are annotated as summit to summit. Each of the operators in this contact is both chaser and activator, but each is limited to a single summit to summit microwave award for that contact. As in the previous example, each may add three more contacts in any band for non-microwave awards and each may move to different summits in the same day.